Imagine that you are completely on your own for your water. You cannot go to the tap and simply twist a knob and get sparkling glassful of delicious safe water. You don’t have a trustworthy government system of piped water like people over in the US. On the contrary, your ground water makes you sick when you drink it. It is so bad sometimes, that you get skin infections when you bathe in that water. You cannot afford to buy bottled water for your own drinking needs let alone your spouse and 4 children. What you do is boil your water or drink it straight. Some months you can afford cooking gas to boil your water,. Sometimes you don’t have the money and need to go out and cut forest wood to boil the water. That is IF you are lucky enough to live in a forested part of the world. You can afford some devices already for sale in your country, but they don’t meet the minimum quality standards needed to keep you from getting sick. If you are lucky you will be able to purchase a few sachets of chemicals that you can use to kill most of the bacteria in the water, but this still leaves you exposed to intestinal worms. The sachets don’t seem expensive because each one is so cheap, but then you to add up how much you’ve spent on them in the last few weeks, and it doesn’t seem like a great solution, especially for water that tastes funky. If you are a little more lucky… enough to have $62… then you can buy a LifeStraw filter which meets the quality standards you need to keep your family safe while making the water taste better. Great! You then put your water into your traditional ceramic jug because you love the way it keeps your water cool. You end up getting sick. Maybe from bacteria that has gotten in over the last few months, or maybe a fingerprint inside the jug from one of your kids sick with a stomach bug was enough to get you sick. The Strombus purifier from Triton Ceramics is our solution to all of the problems above. It will be meeting the World Health Organization’s 3-star rating (99.999% of Bacteria, 99.999% of Viruses, and 99.99% of protozoa). The Packed Bed system is the treatment portion that does the heavy lifting, making the Strombus effective against microorganisms. Quality control measures will ensure that each and every purifier that goes out the door works properly. The Strombus purifier is easy to use and clean, and it sits right on your counter top. It doesn’t use any consumables, and costing $30 it will be the least expensive option available that meets the World Health Organization’s (WHO) 3-Star Quality rating. Lasting a year for a family of 6, the device will be good value. It is designed so the customer will not need to replace any part of the filter, but accidents occur, so in the event of damage from misuse, parts will be available. The thing that makes it really special though is, the filtered water has a lasting bactericidal effect. This means that your improved water will continue to remediate bacteria in the case of re-contamination between when the water leaves the purifier and meets your mouth. 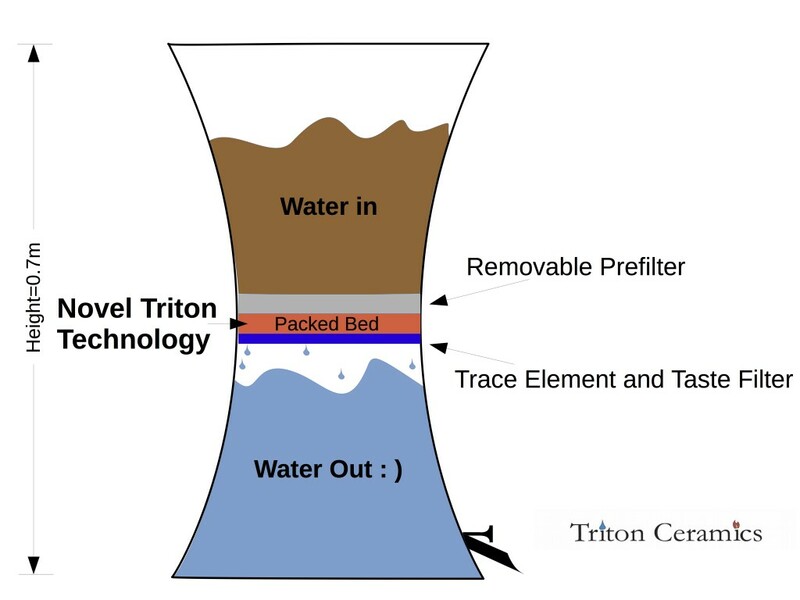 The Triton Ceramics Purifier has the potential to be better than the best treatment option out there. It has the potential to be the future of water treatment. This list comprises the treatment options that are well made, widely available, and rigorously tested. These are compared to boiling as the gold standard in effective microorganism remediation. Options considered on this list are for a family of 5 or 6. The Strombus Costs per liter were calculated from listed prices and the reported lifetime of the filter. Even though the Triton Ceramic filter isn’t quite there yet, I’m set at ease by the lab results which show that we are on the right path to meet the claimed microbiological remediation. But the only way to prove those claims is to test the actual prototype. The coming stage of research is all about vetting the technology and proving beyond a doubt that the filters actually meet the 3-star WHO quality mark. I strongly believe that we have a great shot at making the best filter in the world, and I’m excited to prove that in the next phase! This entry was posted in Blog, Uncategorized on December 6, 2016 by Nick.